CLICK HERE for official (National Weather Service) forecast. March 23, 2018 - 10:30 a.m.
As you can tell, our March is quite tame, though March winds were up some yesterday. 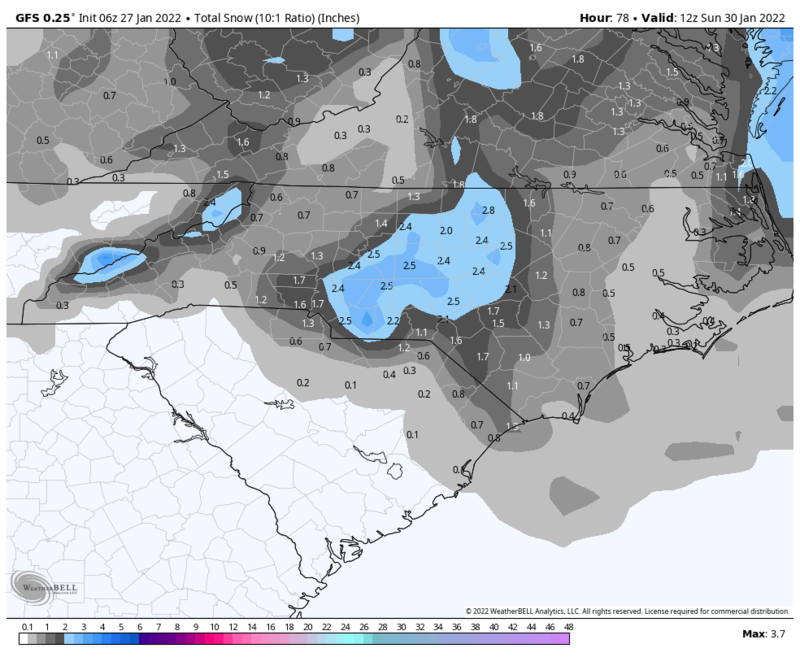 Looking at the 15 day snow prog, you can see the snow has really shifted quite far north by now. Nothing is expected into April (at least first week), and even then for a while. This could be the first snowless March in memory. Interestingly Siberia and far northwest Canada were very unusually mild this winter. But, southern South America, most of Africa and the middle east were way below normal. And, the northen plains were in one of the worst deep freezes on record with temps in the -10 to -40 degrees for months. Global temp anomaly is currently running about .42 C degrees above normal, not nearly the 1.5+ we had back in 2012. So enjoy the spring-like weather. A cool rain occurs Mon.-Tues. with some colder temps, but then, warmth will march on (no pun intended). It is still the most remarkable thing I've seen in all my years of weather watching that this winter we've have had the most extreme example of a La Nina weather pattern (frigid northern plains, warmer and thus rainy for the southeast and VA) all during an actual (Modoki) El Nino winter (which SHOULD bring more snows for VA). I've never shown a timeline for the AO ad NAO. See both have been basically RED lately (at bottom), meaning positive and anti-cold/snow, for a LONG time, some even for years, which explains our mild, less snowy winters for the last few years. Boy, that is a huge monster READ spike at the end (2018-2019 area, that almost went off the chart). THAT ... hurt our chances for a real winter, big time. You may also notice the big blue "drop" negative for 2010, the winter we had 40" in December alone. This forecast is given as is ... with no warranty of any kind. It is for entertainment purposes only. Any action regarding life or property should be contingent on the official forecast of the National Weather Service, an agency of the U.S. Government. Only the National Weather Service is the source of official forecasts ... not the Weather Channel, Accuweather, Weatherbug, WSI [which many TV stations use] or any other private group. CLIMATE NOTE - Kinda for fun. Just givin' some facts. You can send any comments to wmayo444@cox.net or see me! GFS - Global Forecast System - Main US-ran global model - longest range (to 16 days). Recently updated with much higher resolution. NAM + Parallel NAM - North America Mesoscale - Regional, not global model. Canadian GEM and RGEM - Global and regional models. Plus CanSIPs monthlies. FIM9 - New experimental US model using hex high res grid. Supposed to replace the GFS eventually. I do not have BUFKIT. NE - northeast, SE - southeast, NNW north-north-west, etc. MJO - Madden-Julian Oscillation (a cycle of precip-temps based on certain trade winds/currents). There are eight phases. Some of the eight may be of different effect, depending on season. DICLAIMER AND COMMENT: This page is just for fun, and my forecast, may vary from the National Weather Service by quite a bit a times. There is no liability assumed for anything resulting from this page. Do not use this page to plan anything. Refer to official National Weather Service forecasts for responsible action. I took a number of classes in meteorology at the Florida State University School of Meteorology and do study various models and internal weather service discussions, and was fully trained in surface weather observation as an ASOS augmenter in preparation for working at an FAA surface weather station administered by NOAA. In any case, any forecast on this page which is more than 8-12 hours old should be disregarded as out-of-date. If you have any comments, leave me e-mail.